AMD on Monday introduced four new processors aimed at commercial laptops. The new AMD Ryzen Pro 3000-series as well as AMD Athlon Pro 300-series processors pack up to four x86 cores as well as AMD’s Radeon Vega integrated graphics. Because of improved power efficiency, AMD says that laptops powered by its latest Ryzen Pro APUs will work for up to 12 hours when used for general office workloads. AMD’s new Pro-series processors are essentially the Ryzen Mobile 3000-series APUs and made using GlobalFoundries’ 12LP process technology. 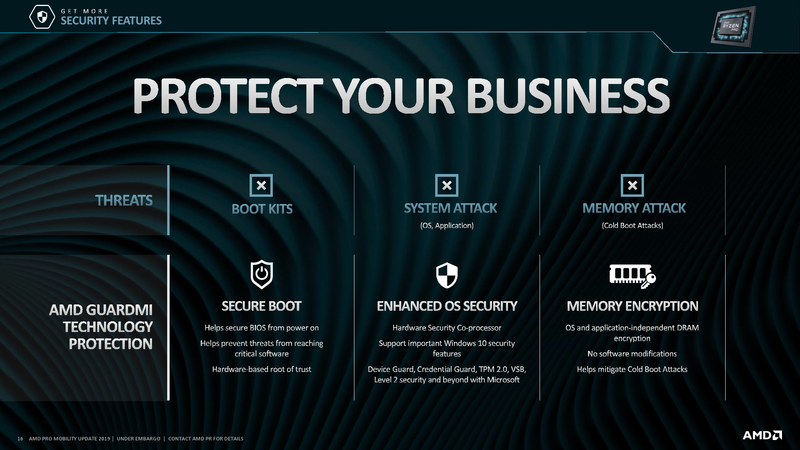 The parts have numerous features supported by AMD’s Pro-series products, such as a built-in TrustZone security processor, DASH manageability, Secure Boot, Content Protection, per-Application security, fTPM 2.0, Transparent Secure Memory Encryption (TSME), and some other technologies are they key feature which differentiate AMD’s Pro from the company’s regular processors for client PCs. Furthermore, AMD uses wafers with highest yields/least amount of defective parts to build the Ryzen Pro in a bid to meet long term reliability. These CPUs are covered by a 36-month limited warranty, up from 12-month warranty for consumer processors. 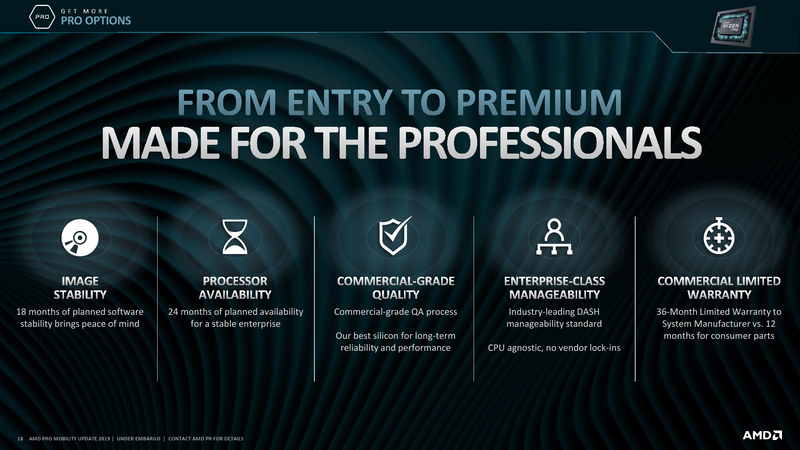 AMD also guarantees that its Pro-series products will be available for at least 24 months after initial launch and also provides 18 months of planned software stability. 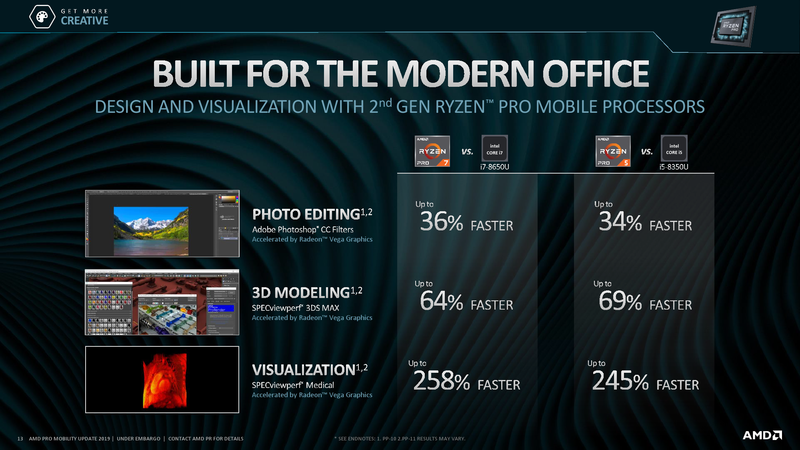 The family of AMD’s 2nd generation Ryzen Pro Mobile processors includes four models: the Ryzen 7 Pro 3700U, the Ryzen 5 Pro 3500U, the Ryzen 3 Pro 3300U, and the Athlon Pro 300U. The Ryzen Pro-branded parts feature four cores with or without SMT, whereas the Athlon Pro device has two cores. All of the APUs have an integrated Radeon Vega GPU, yet with a different configuration. The new APUs feature a TDP of up to 15 W and are therefore aimed at ultra-portable laptops. When compared to AMD’s 1st generation Ryzen Pro Mobile parts, the Ryzen 7 Pro 3700U and the Ryzen 5 Pro 3500U offer slightly higher base as well as turbo clocks. By contrast, the Ryzen 3 Pro 3300U features a lower base frequency, yet a slightly higher turbo frequency, when compared to the Ryzen 3 Pro 2300U. AMD’s own tests show that its Ryzen 7 Pro 3700U is ~1% better than the 8650U in PCMark and up to double in performance when graphics comes into the mix. Obviously, GPU-intensive workloads are the ones where AMD’s APUs outshine Intel’s CPUs. 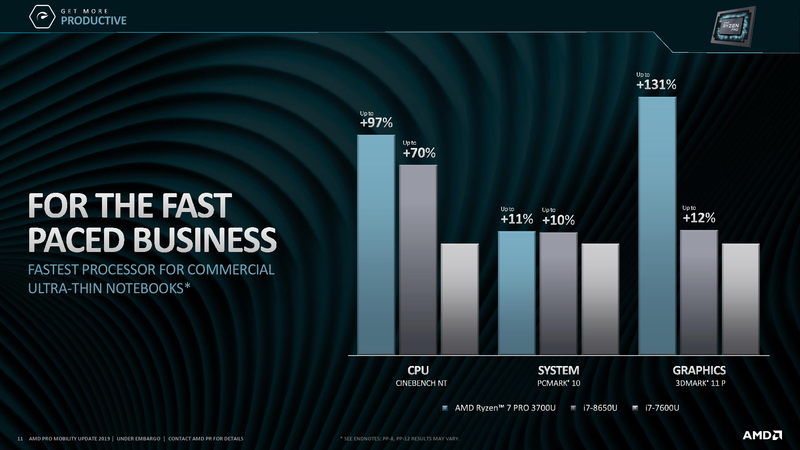 Meanwhile, general-purpose performane of AMD's and Intel's processors for commercial laptops is very close, according to AMD. AMD has already started to ship its Ryzen Pro 3000-series and Athlon Pro 300-series processors to its partners among PC makers. HP and Lenovo are expected to be the first to offer commercial laptops based on the new APUs. Other manufacturers are projected to follow later in 2019.